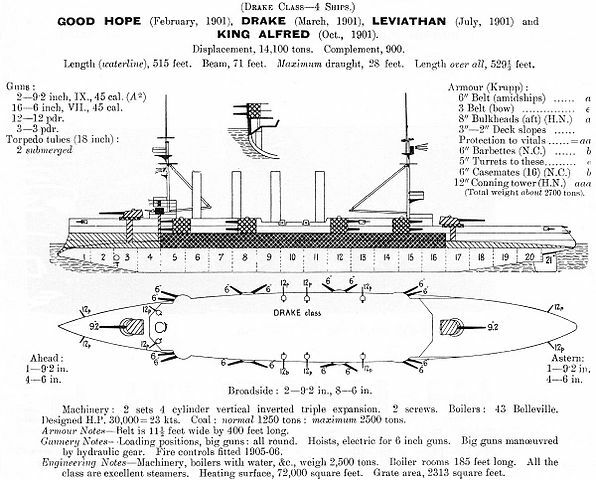 Drake, Good Hope, King Alfred, Leviathan. 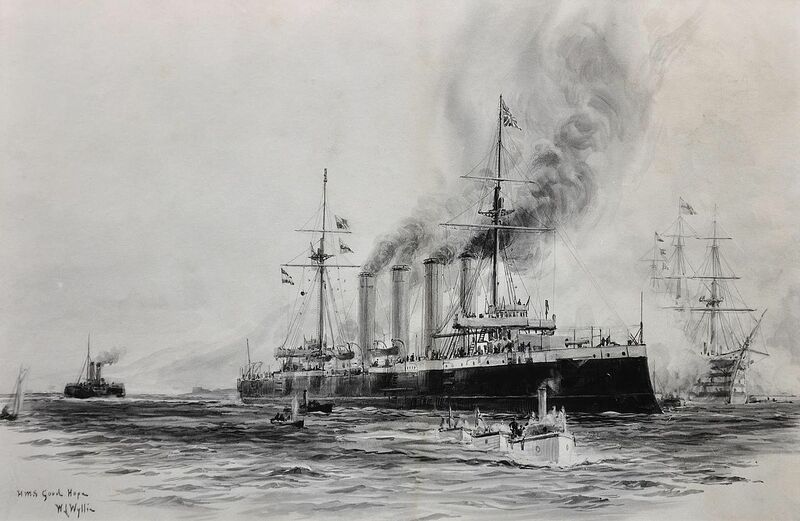 The 1897 Powerful class marked its era as the most impressive cruisers in the Western Hemisphere, but they has been considered since as one of a kind “white elephants”, leading to the construction of more reasonable series of the Diadem (1898) and Cressy (1900) classes, the first eight being the last massive protected cruisers, while the new ones were the first true “armoured cruisers”; They were to be designed by Sir William White, Chief Constructor of the Royal Navy, in response to the new French armoured cruiser Jeanne d’Arc. 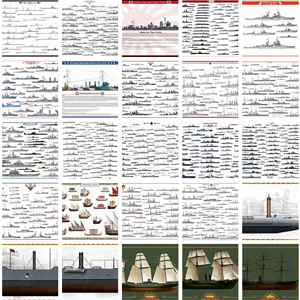 There was also the threat of new armoured cruisers being built in Russia, Italy or Japan that triggered plans for a larger class of ships anyway, leading to the Drake class. Two were sunk in action, two survived the war. 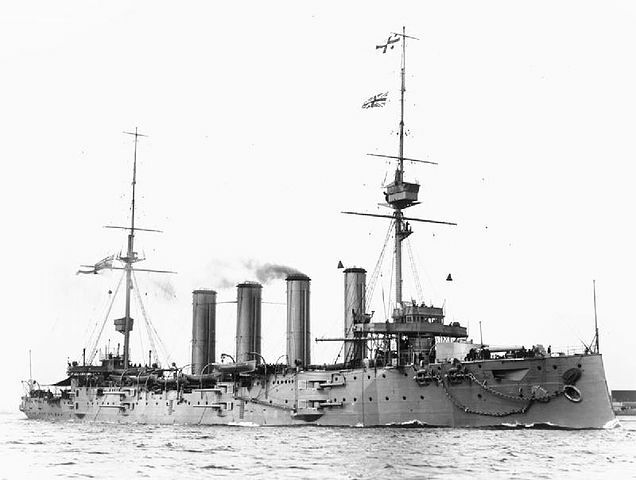 HMS Good Hope, the only one sunk in battle. 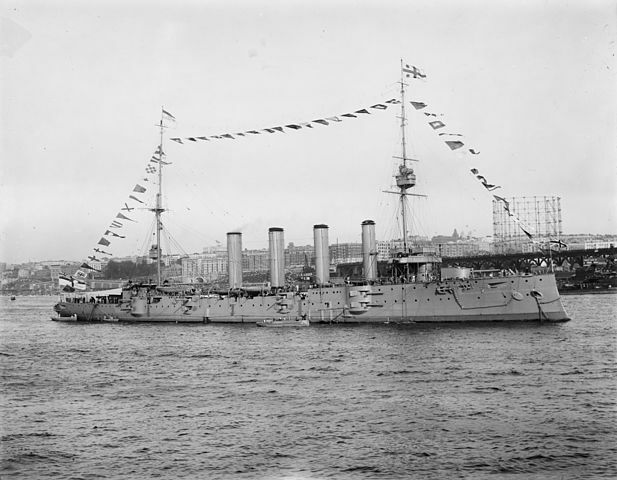 The Drake was provided under the 1898/99 programme, as armoured equivalent of the earlier Powerful class. Compared to the previous Cressy they were about 3000 tons more, most of the extra space being dedicated to boilers for an increase of 2 knots, at 23 knots. This extra space also helped stacking four more 6 in guns and improvements in protection. They has been started respectively at Pembroke (April 1899), Fairfield (Sept. 1899), Vickers (Aug. 1899) and J Brown Clydebank (Nov. 1899), launched in 1901 and accepted into service in 1902 (Good Hope) and 1903. On trials they all exceeded their expected top speed (24 knots for Drake), even achieving hours long cruises at full speed without incident. They were considered good steamers, excellent seaboats. Their large size meant their operational career was spent as cruiser squadron leaders. 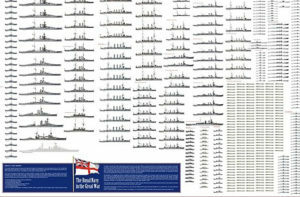 By size, these ships were much larger than the previous Cressy, in lenght particularly with 152 m instead of 134 m, and were wider also at 21,74 instead of 21,18 m, but the same draught. Their impressive machinery comprised 43 Belleville boilers, feeding four Triple expansion 4-cycle engines producing a total of 30,000 ihp for 23 knots. They carried 2500 tons of coal versus 1600 on previous ships, making them suited for far overseas stations. Armour scheme was of a “all of nothing” type, based on the Cressy. However the protective deck was 2,5 in between the stern and aft bulkhead, side armour was 6 in, on 80 m, then reduced to 4 and 2 in on both ends. The bulkhead themselves were 5 in thick, the turrets were protected by 6 in cast armor, as well as the barbettes, 5 in for the casemates and 3in for the ammunition tubes while the conning tower was 12 in (305 mm) thick. Armament was better than previous classes, with a total of two single turreted breech-loading 9.2 in (234 mm) Mk.X pieces, sixteen breech-loading 6 in (152 mm), and fourteen 12 pdr (76 mm) plus three QF Hotchkiss revolver 3-pdr for anti-torpedo boat warfare and two submerged 18 in (457 mm) torpedo tubes. 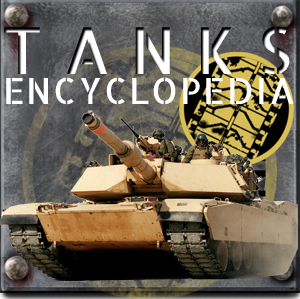 The main guns fired 380-pound (170 kg) shells at 15,500 yards (14,200 m), while the 6 in range was only about 3,000 m shorter. 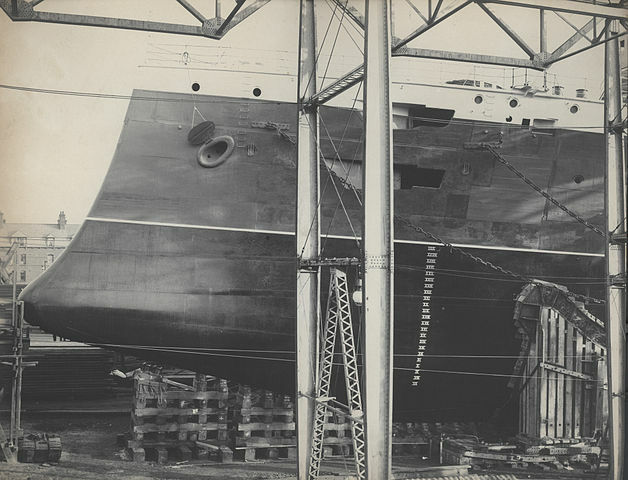 Most of the ship superstructure amidship was omitted. 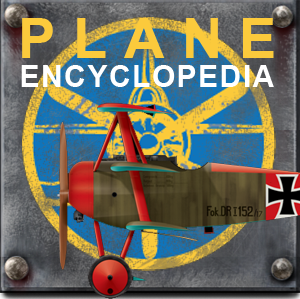 Cowl ventilators were replaced by windsails while other fittings above the upper deck were reduced to the bare minimum. In addition two more 12-pounder 8 cwt guns could be dismounted for service ashore. The lead ship, the Drake was the costier of them all, at £1,050,625. 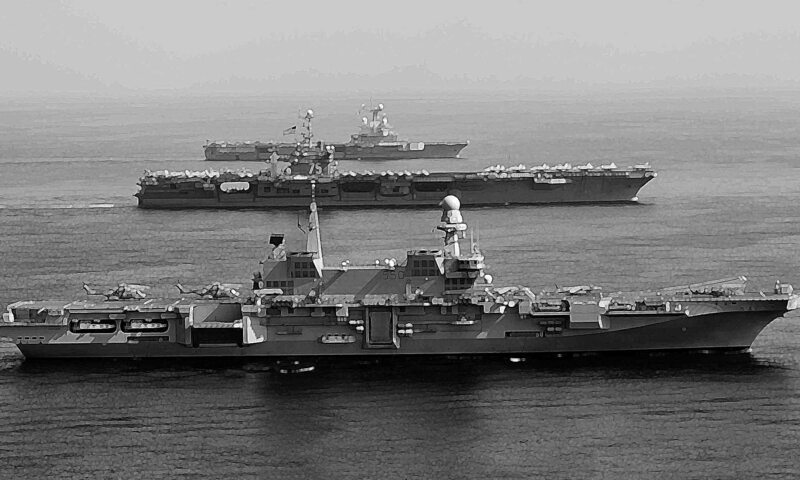 Their operational life began as cruiser’s squadron leaders to justify their large size and cost. 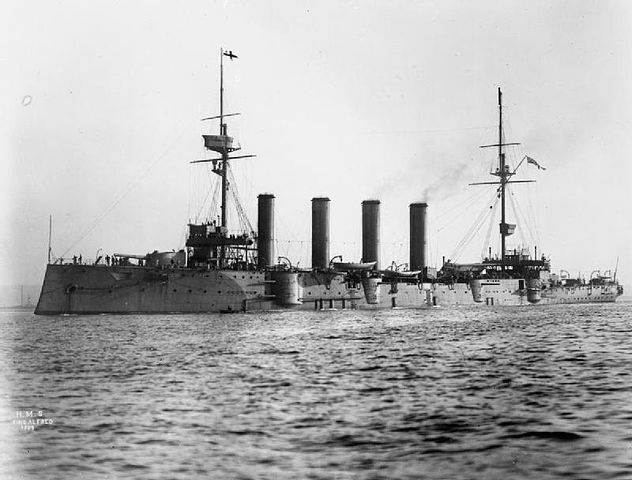 The King Alfred was the CinC in China until 1910, the Leviathan preceded her in 1903-1904, and was also CinC in the Mediterranean in 1905-1906, but the Good Hope and Drake spent their remaining carrer in Home Waters, until the first was sent as flagship of the South Atlantic squadron, under orders of Commander Kradock. 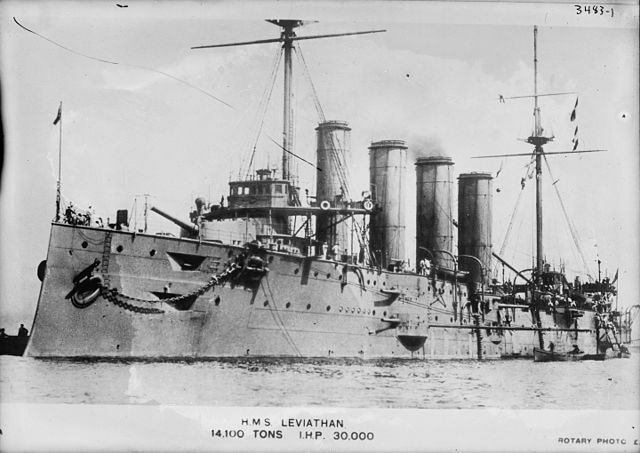 Famously the latter sailed to battle with the Monmouth and Glasgow, facing two formidable German armoured cruisers that punched above her weight, and sank with all hands.